Volume control, sophisticated rhythms, reference pitches, and tap tempo for a song. The Korg MA-30 Digital Metronome is the most useful metronome ever in this price range. Duplets, triplets, and quadruplets with inner beats omitted, and more make playing along interesting and more realistic than a click track. Features a highly visible liquid crystal pendulum, 12 reference pitches, adjustable calibration, adjustable volume, tap tempo, earphone jack, and memory backup. 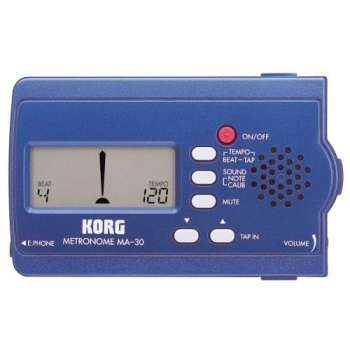 The Korg MA-30 Digital Metronome has a 250 hour battery life.